The Original Multi Game Archive Extractor from the same guys that host this WIKI. MultiEx Commander is a tool that extracts from and edits 400 games at least! Aims at 100% working with all the games it supports. (Auto)Preview of pictures, sounds and the like. Comprehensive editor included. Scripted process enables users to support new games themselves! A tool that extracts files from over 1400 game archives. Many archives can also be edited and saved. Includes file previews for many common file types, and a scanner to locate sounds and images in unsupported archives. Display files in an archive as a table, or as a list of thumbnail images, allowing you to quickly see all the images in an archive. A tool that extracts from and edits a massive number of Game Resource Archives. A tool that extracts from a number of Game Resource Archives. Includes a scanner that will look for sounds and images in unsupported archives. A tool that can read directly (or embedded) music/sound of Game Resource Archives. Plugin for Total Commander that extracts from and edits a massive number of Game Resource Archives. The PRO version of GAUP also can add files to Game Resource Archives! A tool that extracts, views, and allows import on around 50 older games, mainly from Apogee and Epic MegaGames. An all-purpose file identification tool with an easily expandable database, it currently recognizes about 5,000 file types. 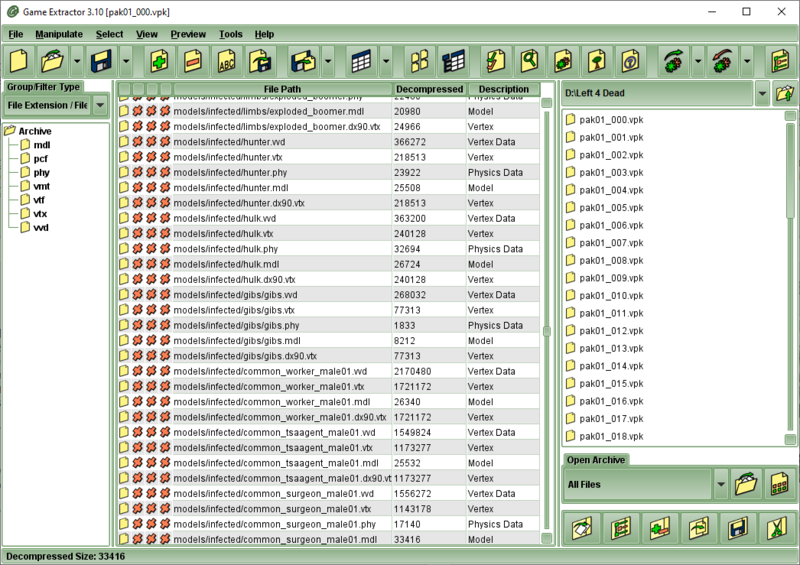 A tool that can extract and re-inject a number of common file types from any other file. A file ripper than can extract and re-inject a number of common file types from any other file. A tool that mounts a GRAF as part of the Linux filesystem. A tool that extract embedded bitmaps (JPEG, PNG, GIF, TIFF) files from any given file. It search for bitmap's headers / signatures and create a new file for every data block that seems a valid image. Tool that can extract files from few of the game resource archives. This page was last modified on 10 April 2019, at 16:28.